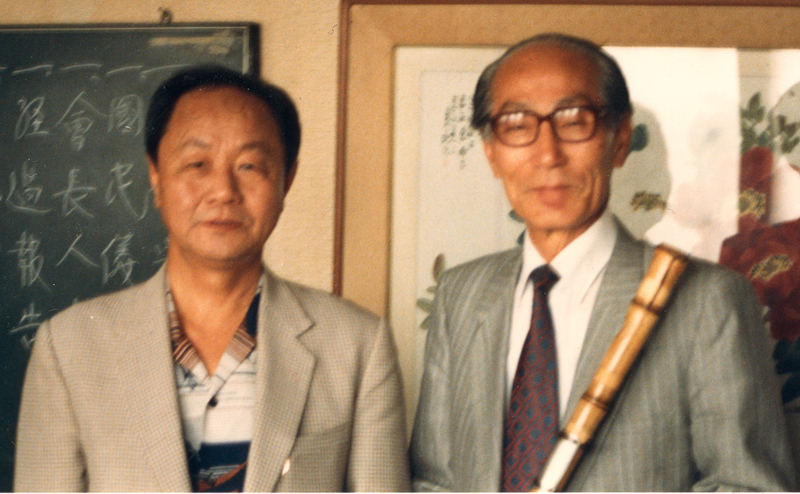 In 1986, I became good friends with Kim Duk Soo 김덕수 the leader of the famous Korean percussion group Samul Nori. The group spent quite a bit of time in Vancouver at Expo 86, at which I was very active as a composer, performer and producer. In 1987, I was invited to perform in Korea and the Philippines, but had almost two months of down time between the performances. I asked Kim Duk Soo if he could set up some lessons in traditional Korean music for me. He arranged lessons on kayageum with the Intangible Cultural Asset Park Gui Hee 박귀희, which I will talk of in another post. Duk Soo also arranged for me to study with the shijo, ancient sung poetry, teacher Park Kiok 박기옥 that had a studio in the same building as Samul Nori in Seoul. 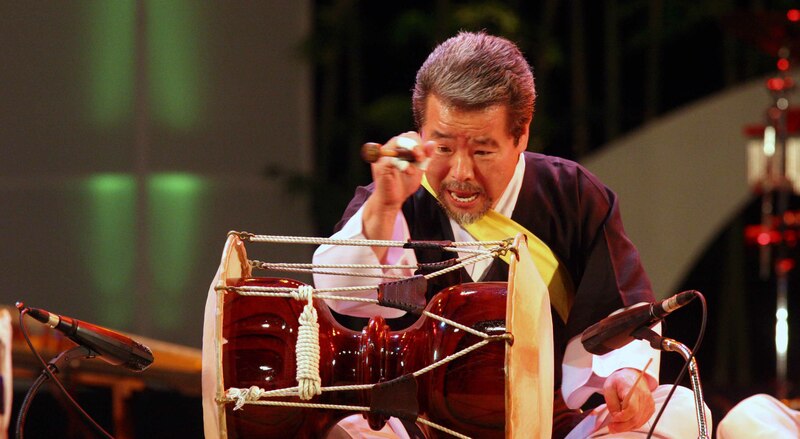 Kim Duk Soo thought that through shijo I would learn the foundation for Korean music, notably the moving tones, or pitches in constant motion. In western terms this is like a highly expressive vibrato that changes in depth of tonal variance, speed, and intensity. Rather than ornamentation this is an essential and defining element of Korean music. Some pitches in a mode are always performed in motion and are never static. My teacher was in his seventies and spoke no English whatsoever, and I knew only tourist Korean. Everyday we would sit on mats on the floor facing each other for the lesson. This is not so unusual in Korea while studying music, except that he was always impeccably dressed in a three-piece suit! For the first few weeks, our lessons went very well, although this was the first time that I had taken any kind of formal voice lessons. After a while I noticed that my teacher was disturbed by something. He kept repeating the meaning of the piece to me and even brought in someone to translate the piece so I understood it fully. Still somehow I was missing something in the lessons and he was struggling with how to tell me. I tried to become as diligent a student as possible thinking I was missing an important detail. Normally when I study with a teacher I imitate them exactly to the point of copying the way they sit move breath, and every detail of their playing technique. This I did with renewed diligence, trying to find what I was missing, I mimicked my teacher almost exactly. Yet, he became increasingly frustrated and on numerous occasions he would crawl around on the floor in his business suit miming the story in an effort to try to get me to realize something about it. Soon after we were at an impasse, both quite frustrated at what I did not understand. The time was approaching that I had to leave Korea, and even though I had not understood this vital part of his teaching, he asked me to come and perform at a gathering of the shijo teachers at his house. I arrived on the appointed day a bit late, as there was a meal involved, and as I was a vegetarian, I didn’t want to embarrass my teacher by not being able to eat anything. My teacher lived up five flights of stairs, and although I was quite winded from climbing them, as soon as I arrived my teacher asked me to sit down and sing for everyone right away. There were about eighty teachers there from all around Korea and including the Intangible Cultural Asset. They split up into two circles, one for the junior teachers and one for the senior teachers, which I was told to join. We started by me singing the piece I had learned and although I was winded and didn’t sing it very well, they were all very supportive of my effort. My teacher then said something to them that I didn’t understand, which sparked some discussion and then it seemed a decision was reached. One by one they each sang a piece. This took hours, as some of the pieces were long, but the time went quickly as I was totally fascinated by the range and depth of expression in the music. This was the first time I had ever heard anyone other than my teacher sing, and there were as many different styles and approaches to the music as there were singers. Many times I heard the song I sang repeated, but each time it sounded so different that at times it was almost unrecognizable. The last two people to sing were sitting beside me in the circle. The first was the Intangible Cultural Asset, whom I was told was 101 years old at the time, or so they thought. His voice was so quiet we had to strain to hear. He sang the same song that I had, but it was remarkably different, with a much deeper range of expression and moving tone than all the others. The person next to me again sang another variation of the song I had learned. I realized that I was going to have to sing it again, and that this was the final master lesson. I was to interpret the song, not to mimic my teacher’s version but to express it in my way, to put the emotion within the song that the story expressed. I took some time to process all the all the techniques I had just heard and let my subconscious choose the appropriate technique for the emotion of the song. I let go of worrying solely about technique. I sang the song again, this time using the depth of my emotion to freely choose from the techniques that I had just heard. Everyone roared their approval as I finished the piece, some leaping to their feet. However, for me the only person that mattered was my teacher, I looked at him kind of timidly, wondering what his reaction to my reckless version of the piece would be. He looked at me directly, his face totally expressionless, then he nodded once emitting a very sharp loud grunt of approval, turned and started talking to his peers. That was all I got from him in praise, but I knew I had finally understood that important point, I had to feel the music and sing it from my soul, and not just imitate. I felt glad that I finally understood while also honouring him by doing a good job in front of his peers. Shijo taught me that playing the notes perfectly every time is not where music lies. Music is found in one’s soul. Techniques are a means to craft sound, and the more acquired, the more shapes the music can have. However, the perfect performance is not how well the technique is used, but how freely the deep inner voices of the musician can choose and utilize techniques to gain total freedom.